Elegant floral wedding cards collection design. Bouquet of ultra violet succulents, purple pink cactus plants, tropical forest leaves, ferns & delicate creamy tiny wax flowers with geometrical golden frame. Beautiful classy wedding suite! File format: .png, .eps, .jpg, .pdf for Photoshop or other software. 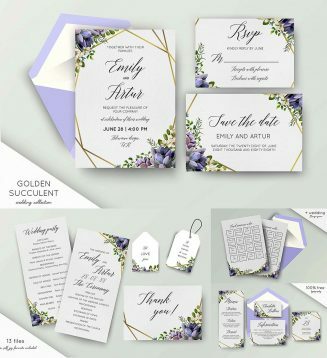 Tags: card, classy, exotic, invitation wedding, invite, jungle, menu, save the date, succulent, tender, wedding cards, wedding suite.